On Monday EU Foreign and Defence ministers had agreed upon joint military operations between countries to develop medium-range missiles and set up an intelligence training school. However, a full alignment remains a distant prospect according to Ulrike Franke, a defence analyst at the European council on Foreign relations. He told the Financial Times: “The term European army is very imprecise. It is a bit like talking about the United States of Europe: you can talk about it but it is clearly not meant to happen tomorrow. However, German Defence minister Ursula von der Leyen believes an ‘army of Europeans’ is a more plausible option which will see military operations work closely with Europe but remain independent of one another. It was agreed this week that France, Belgium and Cyprus will join together to develop a new medium-range missiles whilst Greece and Cyprus will lead a project to set up an intelligence training school. 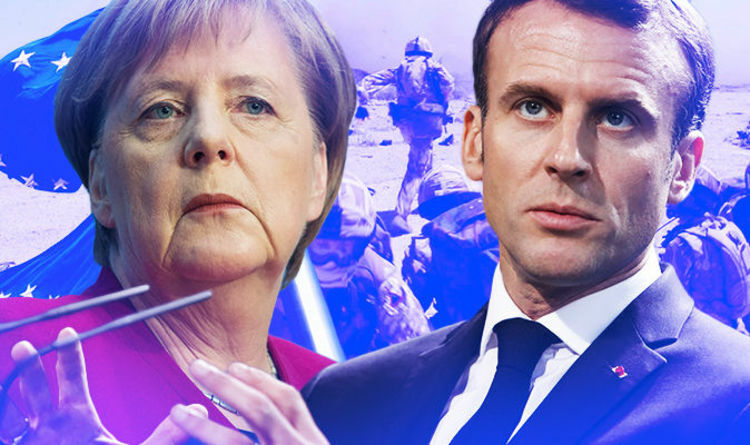 French President Emmanuel Macron first suggested the idea of a ‘European army’ after claiming Europe had become a “victim” of foreign policy, firmly aiming criticism at Washington. The US President then went on a scathing attack on Europe for not paying their fair share to NATO. He said: “Emmanuel Macron suggests building its own army to protect Europe against the US, China and Russia. But it was Germany in World Wars One & Two – How did that work out for France? Mr Trump also called Europe a “burden” on the US and called for “fair” and “efficient” system with the bloc taking greater responsibility. He added: "We want a strong Europe, it's very important to us and whichever way we can do it the best and more efficient would be something we both want.